Soak pecans in milk 2 hours. Heat oven to 350°F. Grease or spray cookie sheet. Sprinkle salt and pepper on chicken. In 12-inch skillet, heat oil over medium heat until hot. Cook chicken in oil 5 minutes, turning once. Place chicken on cookie sheet. Bake 12 to 18 minutes or until juice of chicken is clear when center of thickest part is cut (at least 165°F). Meanwhile, in blender, place pecans with milk, Mexican-style sour cream, cream cheese, nutmeg, salt and bouillon granules. Cover; blend on high speed 1 to 2 minutes or until consistency of sauce. Pour into 2-quart saucepan. Heat over medium heat 6 to 10 minutes, stirring occasionally, until hot. Serve sauce over chicken. Garnish with pomegranate seeds. 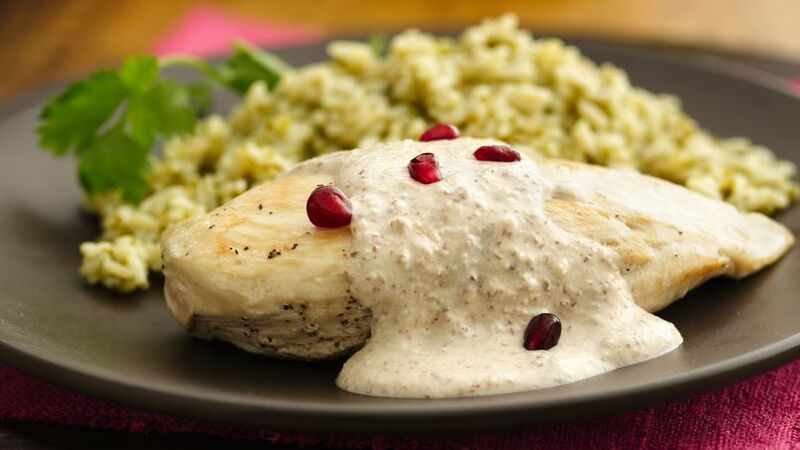 Treat your guests with these chicken breasts served with pecan sauce - a tasty dinner.